This book proposes a synthesis of the basic knowledge necessary to use Maple and the Maple programming language efficiently. A short introduction describes the classic interface and how to interact with the software so that the book may be easily read by beginners. 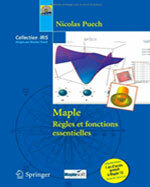 The book then focuses on the fundamental data types available in Maple, on the various evaluation rules, on programming with Maple and on the internal representation of the Maple objects. Numerous easy to understand examples illustrate the presentation.